Paul McGinley reckons he’s ready to blast his way back into the winner’s circle after his worst season for 15 years. But he says he’s not the least bit surprised by Ireland’s amazing winning streak this season and warned fans not to get carried away. After watching Graeme McDowell, Darren Clarke, Damien McGrane and Peter Lawrie lift titles, he said: “It makes me proud of the Irish. I remember reading an article in one of the Irish papers over Christmas asking why Irish golf is in a slump. “But I am not surprised that Peter has won. I am not surprised that Damien has won. I have been saying for a while how good these kids really are. “I’m absolutely delighted for the young guys. It’s great. Especially for Peter. To win so shortly after his buddy Damien winning was a very difficult thing. “As for Darren, I’m not surprised either. He’s a bit of a player. It’s not like he’s come from nowhere. “He’s gone through the emotional turmoil but when your game is as good as Darren’s you are going to have your weeks when you win and he did. “But there is so much more to it than just holing a putt at the right time to win a tournament and your name going on the trophy. 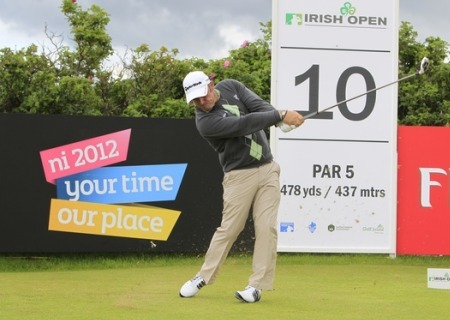 “And anyone who looks deeper at Irish golf will see that there is an abundant of talent. Not just on tour, but coming through. McGinley didn’t have even one top ten last year, slumping from 71st to 207th in the world and to his worst Order of Merit position since his rookie season in 1992. Yet he believes he’s closer than ever to hitting a red-hot streak of form again with three top-tens already this season. He said: “I’ve just got to wait for my week and if I keep my stats as good as they are, I’ll have a hell of a season in the weeks to come. As for the Ryder Cup, McGinley admits that he needs a few big weeks before he can even start thinking about packing his bags for Valhalla. Still 160th in the world, he said: “I’m way off Ryder Cup at the moment. If I could play my way into a position where I could make the team, it would be a different scenario but I am so far away now. I haven’t had the big cheques. “I keep saying if I’m going to make it, I’m going to have to win big cheques. If I am going to get up the world rankings, I’ve got to have big finishes. I haven’t been doing it. One good week could send McGinley’s season into orbit and he’s hoping that it comes soon. He said: “It’s all about confidence. If I keep playing the way I have been, I’ll have my week. It will come. Formula One fan Paul McGinley believes his game needs a major pit-stop if he is to get back on track with a chance to compete. The Dubliner, 40, did not automatically qualify for the elite Volvo Masters on merit after his worst season since he turned pro in 1992. Forgotten man Paul McGinley wants to play his part in Ireland’s sensational tour success story and prove he’s still got the stuff of champions. And that’s why he’s doubly determined to maintain his unbeaten record when he tees it up under skipper Jose Maria Olazabal in the Royal Trophy in Thailand this week.